Wapengo Rocks owner Shane Buckley: “Sustainable aquaculture is something that people can really understand.” Photo: Charmaine Smith. If you’ve ordered oysters at Ben Willis’s Aubergine or Temporada restaurants in Canberra recently, then chances are they’ve been sourced from Wapengo Rocks Wild Organic Oysters on the South Coast. The first certified organic Rock Oyster farm in Australia, Wapengo Rocks is the brainchild of a former NSW ambulance officer who swapped the high-intensity life of an intensive care paramedic to be like an oyster farmer mate of his who drank a lot of beer and giggled all the time. “I said, ‘Donny I want to do want you’re doing’. I said that if a farm comes up for sale let me know,” says owner Shane Buckley. 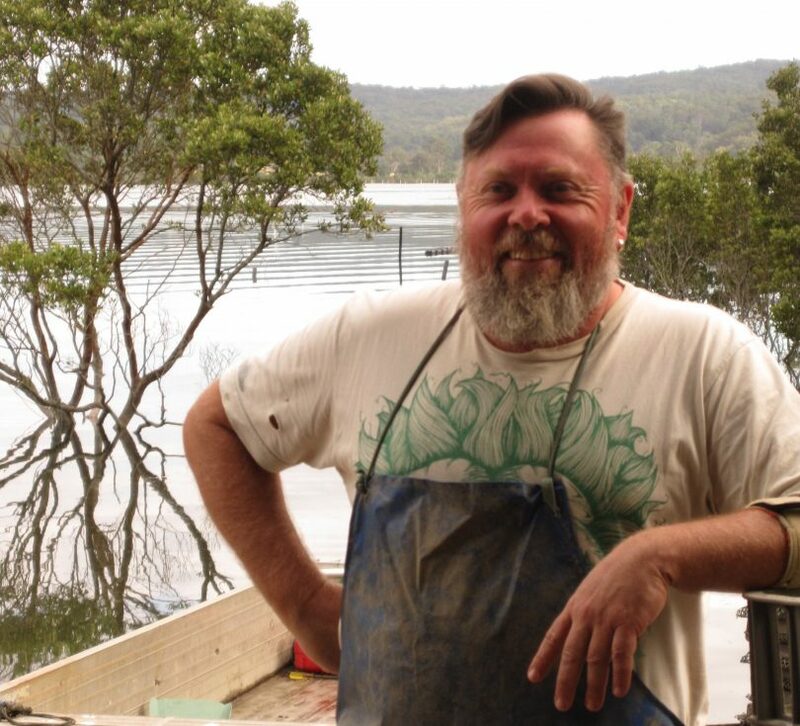 In 2007, the opportunity arose at Lake Wapengo, between Bermagui and Tathra, and the seller became his mentor, introducing him to the new, more sustainable way of growing oysters. “He introduced me to slats and single seed oysters. That was what gave me the idea to just run with it, that direction, and stick with it because it is the future of oyster cultivation,” says Shane, who was quickly sold on the idea of its minimal impact on the lake and the product. Instead of standard ‘post and rail’ cultivation techniques, Shane uses the floating ‘dynamic long line’ system that has less impact on the lake bed and encourages sea grasses to regrow where they previously died off due to over-shading. The long lines with attached floating baskets actively move across the top of the water and ‘sway’ in the currents, letting more light in. 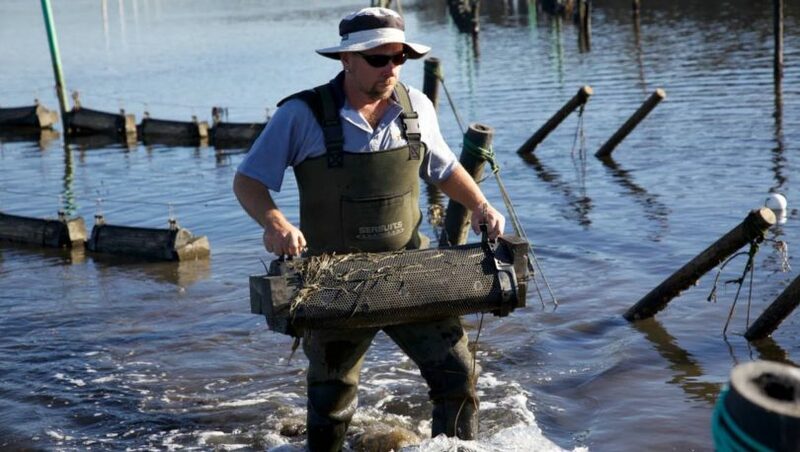 Using only recycled or recyclable materials rather than industry standard treated pine and tar coated sticks, Shane is not only running a more sustainable operation and contributing to the health of the lake but also producing a better oyster. “If you saw the way it was done in the beginning it was pretty ordinary. They used to heat tar up and dip tomato stakes into it and let them drain out in the water, and you’d see a slick come off them, it was awful,” he says. Shane handling one of the floating infrastructures on Lake Wapengo. Photo: Wapengo Rocks. But it was a major investment in time and capital with Shane having to close down old operations and re-equip over several years. Shane bought his mate Donny’s farm in 2012 and now he has about 20 acres of water but with only about a third of that under production. He is poised for a major expansion. In 2013, his first farm received organic certification from Australian Certified Organic (ACO). His business has benefited from the growing interest in provenance and sustainability. “It’s part of the food journey people travel now, they like to understand where their foods come from, how it’s been produced, the people behind it,”says Shane. His best asset is the near-pristine water of Lake Wapengo. “The water quality is as good as you get here. You can see our catchment – Mumbula Mountain, where our water comes from, is completely surrounded by national park. There are few properties, mainly bush blocks and one small dairy,” he says. The flavour profile is seasonal but unique, and they are a superfood, with high levels of zinc, calcium, magnesium, and Omega 3s. “When they are really fat, they’ve got a real soft poached egg consistency to them, a creaminess, vegetal flavour – leguminous,” says Shane. Shane says the Sydney Rock is a special oyster that doesn’t grow anywhere else in the world and Bermagui to the border is the golden triangle, with the stretch to Tathra the main area. He says the industry has only really taken off in the past eight years as a valued product. “We sell at three-and-a-half to four years of age, so it’s a long time to be husbanding an animal in a crop. Back then we were getting 20 cents an oyster, which was absolutely ridiculous. There is better money now and more appreciation for them. Sustainable aquaculture is something that people can really understand,” he says.